Healthcare reform. A competitive labor market. A growing contingent workforce. Hiring in healthcare is harder than ever. Meanwhile, study after study demonstrates that skilled, empathetic, and dedicated healthcare workers have a tremendous impact on the quality of patient care. But, finding the right people to deliver stellar services is harder than ever. Overcome today’s new hiring pressures and deliver the human resources that create measurable advantages to your healthcare organization. 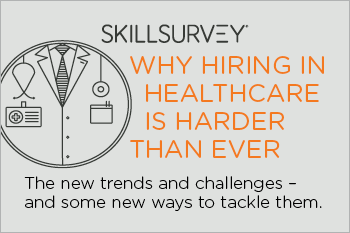 Download the eBook, Why Hiring in Healthcare is Harder than Ever.